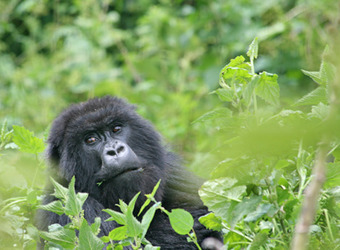 Magical encounters with mountain gorillas are the center of this special-focus safari. Most visitors spend just a day tracking a habituated family of gorillas, but this in-depth adventure includes four full days of gorilla tracking – two in Rwanda’s Volcanoes National Park, and two in Bwindi Impenetrable Forest in Uganda. Each time, you’ll spend an hour in the company of a gorilla group, watching in wonder as they interact, juveniles swinging from vines, mothers nursing babies, the big silverback surveying all. 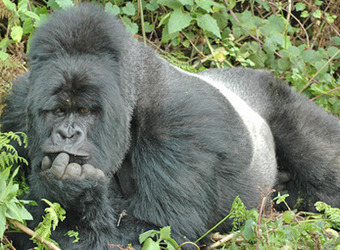 This trip is perfect if you are longing for maximum exposure to mountain gorillas, with an impressive four full days devoted to gorilla trekking. When I was last here, a baby gorilla literally rolled down the forest slope and over the tip of my boot in an attempt to get out of the way of his playful big brother. After the laughter faded, we sat quietly and watched the troop’s silverback male basking in the sunshine until it was time to head back to camp. Nothing compares with the experience of spending even a few hours in the presence of these amazing primates! 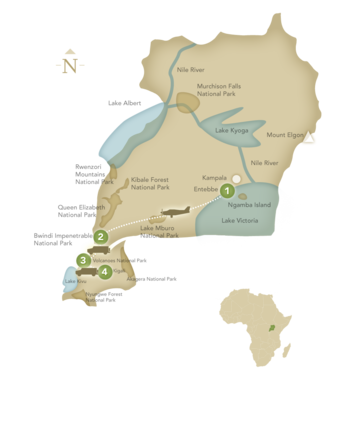 Safaris in Uganda typically start and finish in Entebbe or nearby Kampala. Entebbe, on Lake Victoria, was a former British colonial administrative center. The National Botanical Gardens, laid out in 1898, are a must-see here. 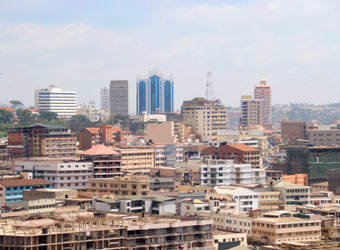 Uganda’s capital, Kampala, was established during the 13th century Buganda kingdom, one of the oldest in Africa. Built among lush hills and wetlands that were once royal impala-hunting grounds, Kampala today is a modern city of 1.7 million. Named for the dense forests it encompasses, Bwindi Impenetrable National Park is home to roughly half the world’s remaining mountain gorillas. Though the park is best known for its outstanding gorilla tracking, it also provides refuge to chimpanzees, monkeys, elephants and various small antelope. Bwindi is a key Uganda birding destination, with 23 of Uganda’s 24 Albertine Rift endemics, including threatened species such as African green broadbill and Shelley's crimson wing. Track gorillas in the early morning on the forested slopes of the ancient Virunga volcano chain in Africa’s oldest national park. Established in 1925 to protect the mountain gorilla, the park was the base for famous American naturalist Dian Fossey’s research. On the western edge of Rwanda bordering parks in both Uganda and the Democratic Republic of the Congo, the combined region is home to approximately 604 mountain gorillas, just over half the world’s total. Your safari adventure ends today in Kigali, Rwanda. iSafari.com's Africa safari planner cannot precisely calculate the costs of air and land transfers to all camps and lodges as the locations and travel distances vary slightly. With this in mind, your final quote may increase or decrease by a small amount. The estimated rates given for these itineraries are adult rates, but many properties offer reduced rates for children. Please contact our office for more information. Holiday surcharges may apply for travel in late December and early January, and occasionally over the Easter holiday. A non-refundable deposit of 25% of the trip fee per person is required upon booking to confirm your reservation.